In my family there have always been Dickens Dogs and in a sense they are my brothers, though we are very different in size, colour and shape. They are yellow and great fun. 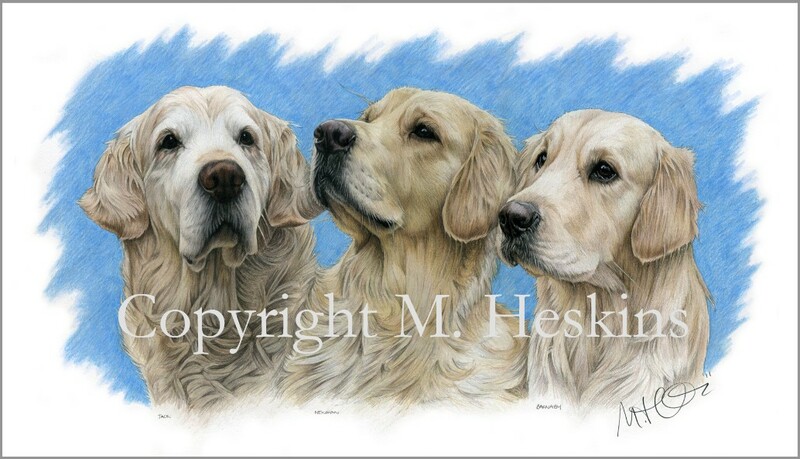 Our friend, artist Maria Heskins, did this lovely portrait of the boys. Perhaps one day she will create one of me. You can learn a lot about the boys from this picture, which captures their personalities very well. When I began my gorgeous life here Uncle Jonny was still alive. He was nearly fifteen when he died. We all love him still and feel him around the place, though he has wild flowers growing on his garden grave. The night he died he told us himself, ‘Do not worry. I am very happy. I will always still be here.’ We all felt so much better after that. Newman is the eldest, being now in his seventh year. He is an east-Midlander, being a Chalksville retriever born in Leicestershire in a surprisingly rural corner of a town, right by a canal. Newman’s two great loves are swimming and seaweed, which would be his specialist subject were he ever to be on Mastermind. His great enthusiasm gets in the way of good sense sometimes and as he is big and strong he can inadvertantly be a bit of a bulldozer. But his heart is very much in the right place and he is deeply kind, and indeed timid, rolling over in the face of force whereas Barnaby will always square up to the challenge and defend us selflessly. 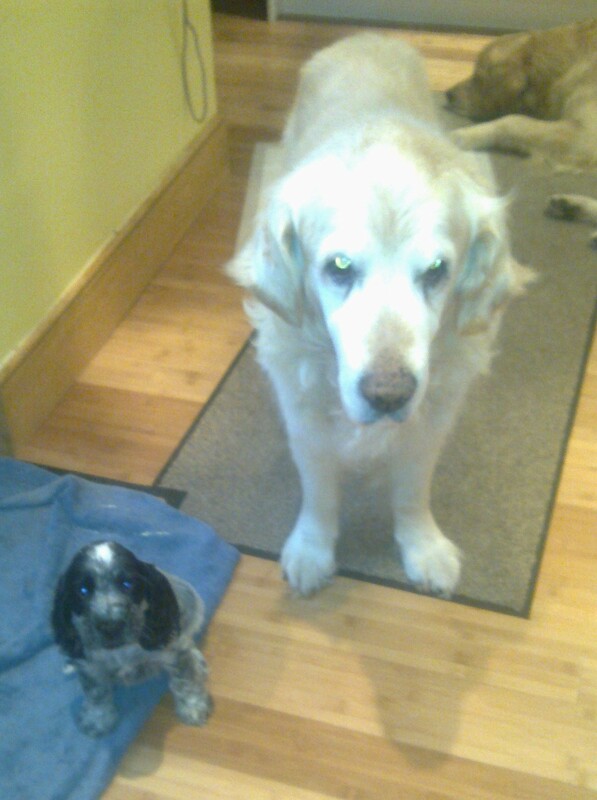 Newman has really only got two settings: on or off. He is either lying flat on his back with his legs in the air, fast asleep, or jumping on us on the sofa, running along six hundred yards away from us on the beach or lying six hundred yards away on the beach, eating his beloved seaweed. It is all very predictable! 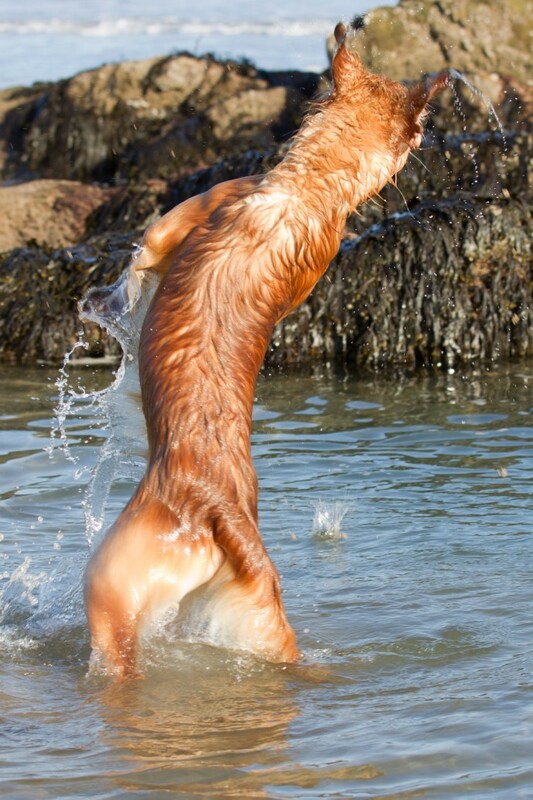 He is at his best when swimming, which he does magnificently and effortlessly – head held high, a true prince among dogs. When I came along, he accepted me without question, very open-heartedly, which was decent of him and I have never forgotten that because to me he is something of an enigma. He and I get on well though and share our night-time dreams, within the cushioned world of our cosy kitchen. Barnaby is closest in years to me, being nearly four. He is Uncle Jonny’s great-great nephew and shares his Tilldawn genes. 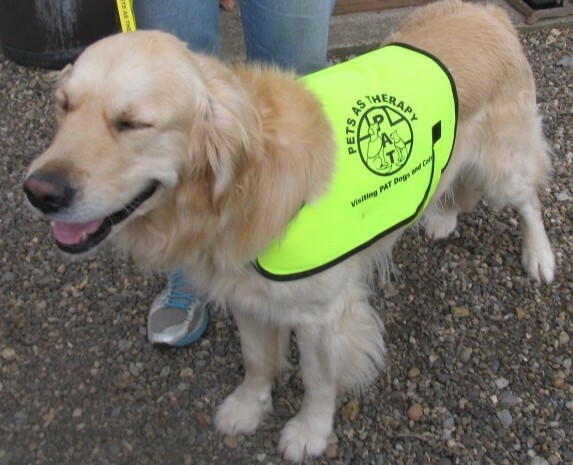 As you can see, Barnaby has a job, visiting folk as a Pets As Therapy dog; he had to pass an examination for that, so big up, as they say, especially as he did it so young. His calmness and equability mean he can always be relied on to meet the public sensibly, which is about as unlike Newman as it’s possible to be. From the word go, we are told, he was Mr Sensible and from eight weeks old was attending classes beneath Mum’s feet and learning a good deal about the Romans. Barnaby’s great love is retrieving, an obsession which has ruined his health, you might say, as he pulled something in his knee and had to have a big op which put a stop to all the mad bounding about, probably forever. When he sees a ball, you can see his face light up. He loses all his good sense when he sees one careering through the air, so we have to protect him from himself, which is a thankless business.